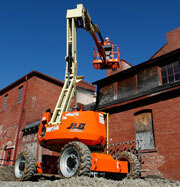 One of the newest machines from JLG, the 1500SJ received top honors in the aerial lift category of the 2010 Leadership in Lifting Equipment and Aerial Platforms (LLEAP) Awards competition. The competition, held by Lift and Access magazine, honors innovative products introduced to the industry between April 1, 2010, and March 31, 2011. Each entry was judged on leadership, influence, benefits and innovation. LLEAP Award winners will be recognized in the November-December 2011 issue of Lift and Access. Check out the December issue of OH&S magazine. 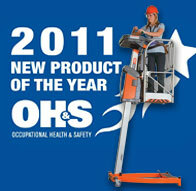 The LiftPod® FS60 has won Occupational Health & Safety magazine’s 2011 New Product of the Year Award in the Fall Protection category. Every entry in the contest was a product introduced to the market between July 3, 2010, and July 3, 2011. The FS60 is extremely portable, fits through doorways and features up to 12 ft working height. The 340AJ was a recipient of Equipment Today’s inaugural Contractors’ Top 50 Products Award. The winners are based on new products featured in Equipment Today and on ForConstructionPros.com over a 12-month period. The 340AJ won in the Lift Equipment category. 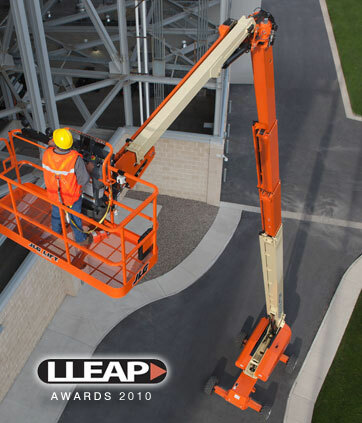 The lower cost of ownership and acquisition cost, coupled with its reach and terrainability, make the 340AJ ideal for general contractors, steel erectors, painters and commercial construction workers, among many others.